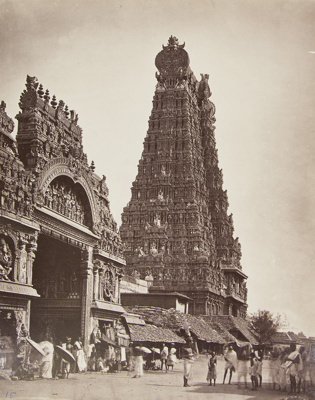 About this objectView of a gopuram on the east side of the Meenaskshi Temple complex. The gopuram is a large pyramidal, colorfully painted entrance to the temple. The temple was originally built in the 6th century and has been rebuilt and added to over many centuries. The location is the city of Madurai in Tamil Nadu. During the British occupation, and when this photograph was taken, Tamil Nadu was known as the Madras Presidency.